Mobile virtual reality is finally here. With the Pasonomi VR Headset, you can play amazing games, watch 3D movies in your own private cinema, The Pasonomi VR Headset drops you right into the action-and it's only from Pasonomi . - Made of recyclable ABS environmental materials,much lighter than like products so you can play and watch more comfortably. 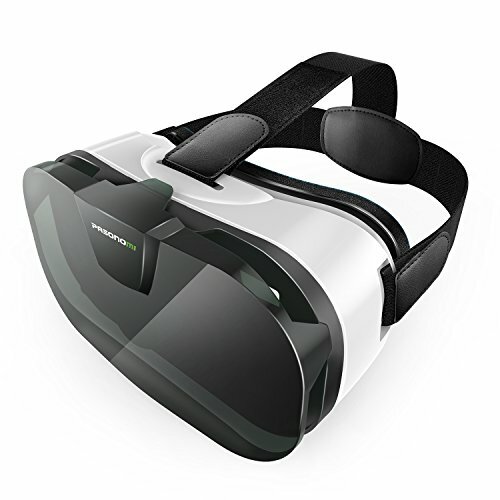 - Innovative Design: made of high-gloss transparent cover enhanced virtual reality effect,removable foam pad for easy cleaning,adjustable headband for the needs of different groups of people,make it comfortable to wear while watching movies or playing games. - IPD adjustment: the use of opposing gear technology, synchronous movement around the lens barrel is not about avoiding synchronization causes ghosting. - Aspheric optical lens design,0-600 ° naked eye viewing support, 600 ° or more to support the use of glasses,Pupil distance and focal distance could be adjustable,brings you stunning immersive 3D experience. Android Devices:Samsung S3 S4 S5 S6 S6edge S6edge+ S7 S7 egde S7 plus Note2 Note3, Note4 Note5, LG, Sony, HTC, etc. 2. Put your phone at the centre of the cover and push tight. 45 days free replacement service, 12 months warranty for all products from Pasonomi. 2. FD & OD Adjustment : Adjust your suitable focal distance by rolling the gear at a range of 55mm - 75mm, and adjust the object distance by pushing the button so as to get a stretch lenses. 3. Comfort design with sponge area - Extemely soft and thick foam is perfect long time use. Top light and thin is the ultimate goal for wearing equipment, Just only weight 263g. 4. Ergonomic Head belt Design : Ergonomic design ensures a balanced stress condition in three points on the head (concentrated on the forehead), reducing 30% pressure to the eyes. 5. Wide Compatibility - It supports smartphones with 4.5-6 inches screen, such as iPhone X 8 7 plus/6s/6/6 plus, Samsung s8/s8 Plus/s7/s7 Edge/s6/s6 Edge Note8/5/4/3, LG g6 g5 g4 g3 v20, and Daydream phones like Google Pixel/Pixel XL/Pixel 2, Samsung s8/s8 plus, Moto Z/Z Force, Huawei Mate 9 Pro, etc. If you have any questions about this product by PASONOMI, contact us by completing and submitting the form below. If you are looking for a specif part number, please include it with your message.